In Sullivan County, most business must obtain a business license and report their gross receipts to the Tennessee Department of Revenue on a yearly basis. 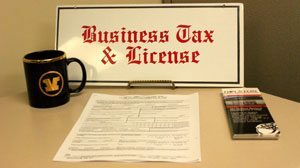 In Sullivan County, anyone conducting business (with gross sales of $3000.00) is required to purchase a business license and each year is required to renew it by filing a business tax return with the Tennessee Department of Revenue. The initial cost of the business license is $15.00. An application must be completed (Click Here to obtain Business Application) or you may also obtain one in our office. Applicant can also apply online at www.sullivancontytn.gov (online services, then business license application). If you will be purchasing an existing business, please complete the New owner agreement (click here to obtain the New owner form). A transient vendor is a business whose main location is out-of-state and will only be selling merchandise or offering a service on a temporary basis. A transient vendor is required to obtain a 14-day permit from this office in order to conduct business in Sullivan County. The cost of a transient vendor permit is $50.00 for each 14-day period the business is located in the county. Affidavit signed and notarized from each individual listed on item D of form, stating that they have not been convicted of a felony within the past 10 years. And purchase a Business License. You must notify this office and file a final business tax return in order to close your business!